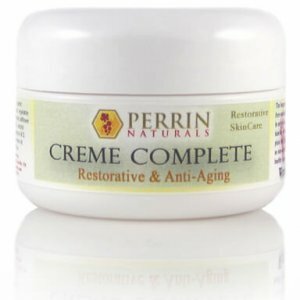 A totally natural approach to treating fine lines and sun damaged skin. Anti-Aging. Moisturizing. Restorative. A Face and Body Treatment. 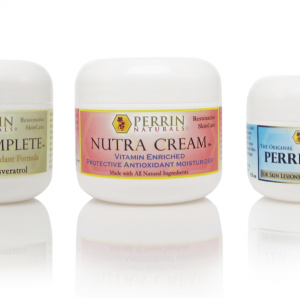 Perrin Naturals Lotion Rejuvenation is a light lotion which will both soften your skin and offer treatment for fine lines and sun-damage. It is 100% natural with absolutely no synthetic ingredients or preservatives. 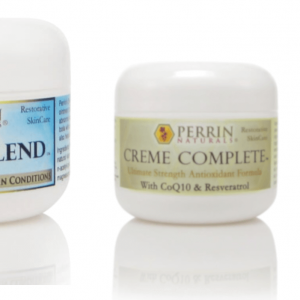 Lotion Rejuvenation is ideal for skin that is both sun damaged and dry or for more mature skin. It is also ideal if you need to treat large areas of skin like shoulders, neck and chest. Like the Creme Complete, the Lotion Rejuvenation contains a high concentration of vitamins and antioxidants to help correct damaged skin caused by sun exposure, environment, and stress. 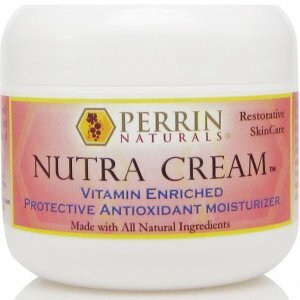 This is a totally natural formula designed to lessen lines and wrinkles for younger, healthier looking skin. It contains ingredients that purify and protect your skin against free radical damage and revitalise ageing skin cells. Also natural oils that will soothe dryness and deeply hydrate your skin through out your whole body. Resveratrol and grape seed extract to help correct and restore damaged skin. Antioxidants to fight free-radical damage: CoQ10, alpha lipoic acid, N-acetyl cysteine, vitamin C & E.
Alpha lipoic acid to fight fine lines and wrinkles. Jojoba oil to help balance out oily and acne-prone skin. Organic Rose Hips Oil combined with Jojoba oil, organic Extra Virgin Coconut oil, and organic Shea Butter. Fragrance of essential oils of Geranium, Cedar Wood, and Frankincense.